Art is a fantastic way for kids of all ages, and adults too, to relax, unwind, and get reflective!! 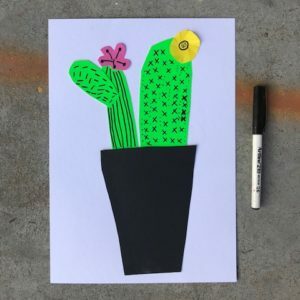 There is a real satisfaction in simple acts such as drawing, cutting, and glueing, as in this fun no-mess project. 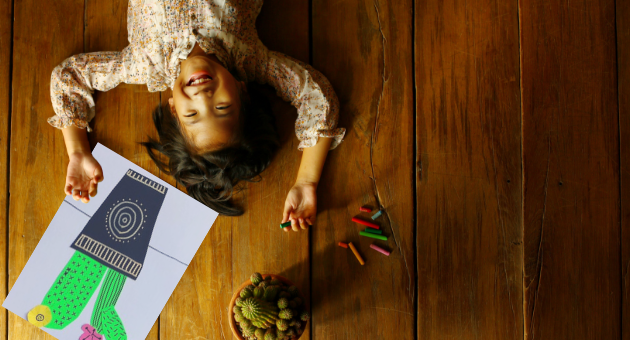 Suitable for kids from 4 yrs and up – a great project for little kids to practice their scissor skills, and improve fine-motor skills. This can be as simple, or as decorative and detailed as you want. 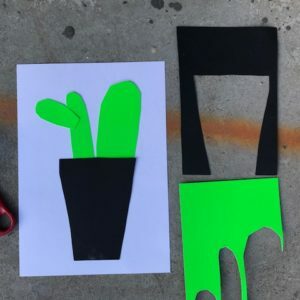 In this project our inspiration is the cactus- we will create a bold and colourful design using simple shapes. Let’s get creative! 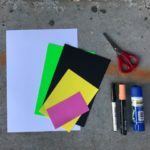 All of these supplies can be purchased from Officeworks or can be substituted with a range of other coloured paper/card you may have available at your house – old wrapping paper/ newspapers/ magazines. This can work really well as an upcycle project, allowing for some super creative fun outcomes. 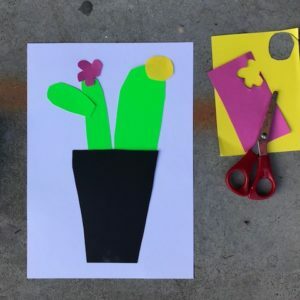 Create your cactus shapes – draw and cut out a series of ‘arched’ shapes. A couple of big ones, and some short ones. Make them long and skinny. Create your pot – this can be whatever shape you like – square, rounded, skinny, wide. Cut it out. Arrange and glue – glue onto your A4 mount card. Flowers – cut out a few small simple flower shapes. 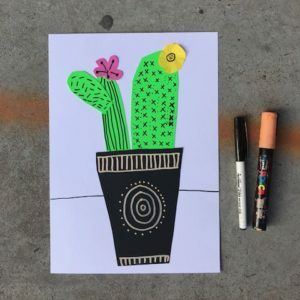 Black pen – create spikes for your cactus – these can be drawn in many different ways – stripes, crosses, dashes, spots. Try a few different ways. Add detail in your flowers too! Pattern your pot!! However, you want! Spots/stripes/zigzags/diamonds/swirls.